Earlier this year, Ducks Unlimited was awarded two $1 million grants for wetland habitat conservation and restoration in Colorado and Kansas from the North American Wetland Conservation Act (NAWCA) standard grant program. Both grants will help Ducks Unlimited and its partners continue providing important wetland and grassland habitat for migratory birds. 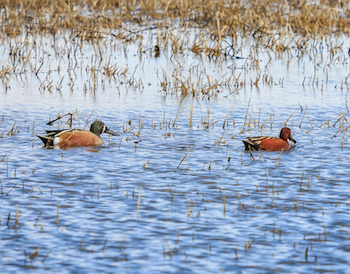 According to Reddy, the ability of the South Platte Basin to support abundant populations of waterfowl continues to be challenged by the increasing pressure on the river to supply municipal, industrial, agricultural and recreational resources. The Platte River Wetlands Partnership, now in its fourth phase, is currently working to improve habitats on publicly-accessible tracts along the river in Colorado, with the majority of the project focused on public properties or on areas that are adjacent to already conserved properties. The project is aimed at improving the quantity, quality and availability of preferred habitats for the ducks, geese and other waterbirds that rely upon the Platte River as a stopover point on their migration to and from breeding grounds to the north. The Kansas Prairie Wetlands project includes a number of important wetland complexes that have been identified as areas of significance to North American waterfowl and other wetland birds. In particular, Quivira National Wildlife Refuge and Cheyenne Bottoms have been identified as areas of regional and hemispheric importance to shorebirds by the Western Shorebird Hemispheric Reserve Network (WSHRN). These habitats provide critical links between Prairie Pothole breeding areas, the Rainwater Basins in Nebraska, and wintering habitats along the Gulf Coast and in the High Plains playa region of Texas; and they support hundreds of thousands of shorebirds during migration within the Central Flyway.